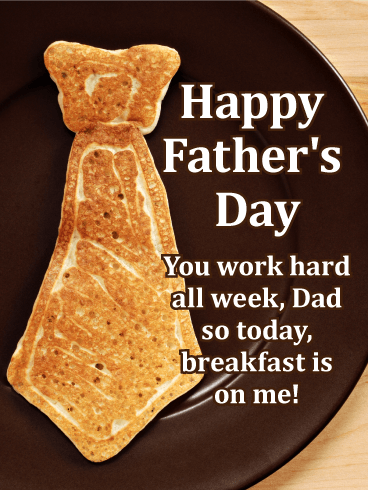 This funny but heartwarming card is one sure to make dad smile. A young boy drawing on his dad’s face while he’s asleep will definitely get him into trouble. But he just thinks he’s being creative. 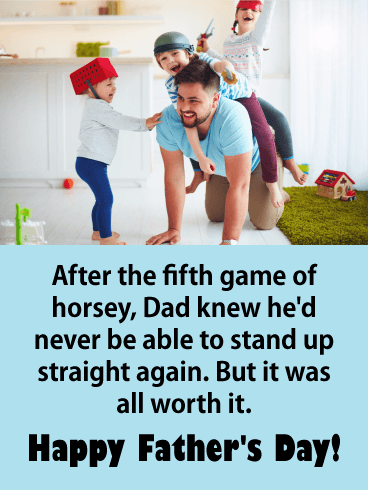 Whatever the case, these are the memories that you’ll both never forget, which makes it the perfect greeting for a son to send to his dad on Father’s Day. A reminder that no matter how old you get, it’s those small moments together that he’ll always carry with him in his heart. 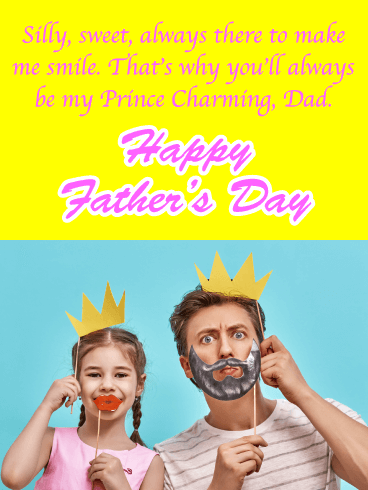 Whether she’s still young or already grown with a prince of her own (or still waiting to find the perfect one), this silly but sentimental Father’s Day card is the perfect way for a girl to let her first Prince Charming know that he’ll always hold a special place in her heart. With funny crowns and other props, it’s a sweet greeting to send him, whether you’re celebrating together or across the miles. 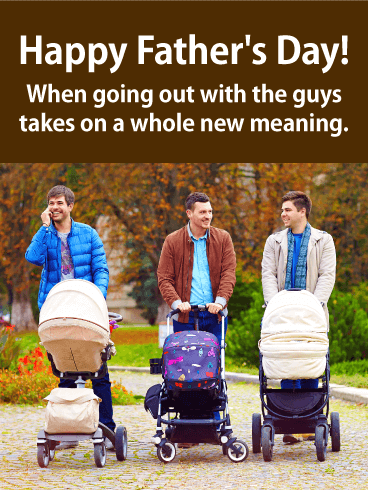 This funny Father’s Day card is the ultimate rite of passage for every son-in-law! It’s a chance to tell him that this year, he’ll be manning the grill, while you go into retirement, relaxing with a beer. It’s silly and a little bit sentimental. After all, you are letting him know he’s your favorite, which is why you’re passing this honor down to him. He’ll have plenty of years ahead to celebrate! 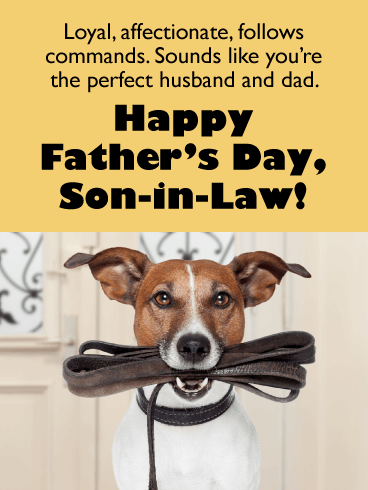 This Father’s Day card is sure to have your son-in-law howling with laughter. It’s a chance to let him know that he possesses a lot of great qualities…that may or may not be the same as the family dog! Featuring the picture of a cute pup with his leash in his mouth, it’s a funny way to wish him an awesome day while also putting a smile on his face. We’ve all been there. The kids have attempted to make a meal for a special occasion and wind up making a mess instead. Sometimes you just have to sit back and laugh about it, which is exactly what this Father’s Day card for your son-in-law aims to do. They may not be five-star chefs, but at least they tried. It’s guaranteed to get him laughing…and probably making reservations! 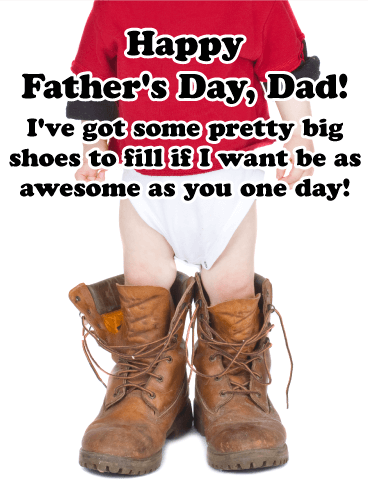 The Handy Man Dad Funny Father’s Day Card is packed with silly puns to make your son smile! We pulled a bunch of jokes out of our toolbox for this one! 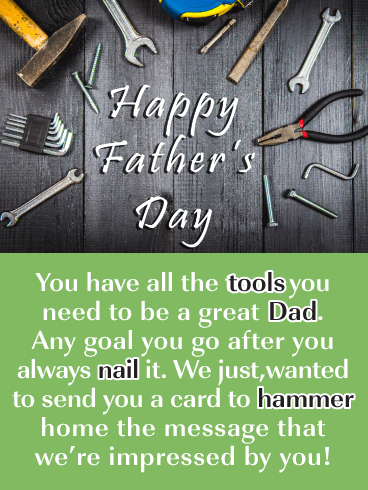 Hammer the message home that you want him to have a very Happy Father’s Day. He has all the tools he needs already, and this card really hits the nail on the head in letting him know. Sometimes it seems like just yesterday you were handing your son his baby bottle and now you’re handing him beer bottles instead– while he hands his own children baby bottles! The circle of life is beautiful. 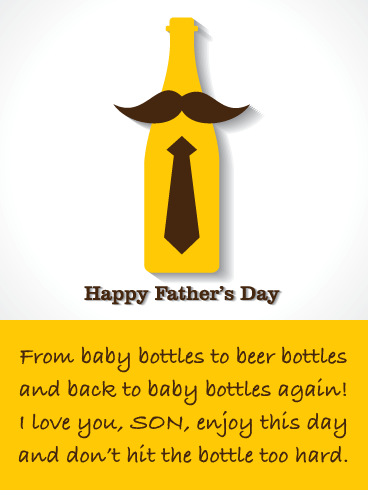 Send the Hit the Bottle Happy Father’s Day Card to wish your son an enjoyable time and remind him not to party too hard. He’s a father now after all! I think we can all agree that dads are everyday heroes. Underneath that suit and tie beats a heart of gold. He swooped into your life and kept showing up every time you needed him. Send that incredible man this fun, comic-book style card. 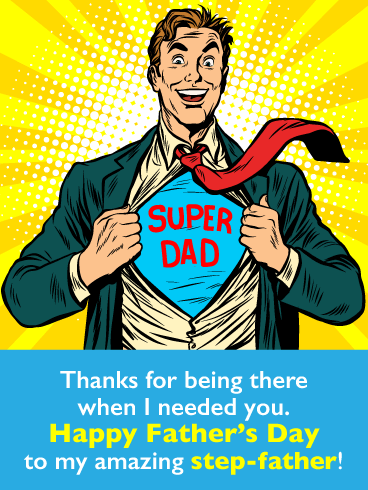 The Super Dad Happy Father’s Day Card is sure to bring a huge smile to your Step-Father’s face. 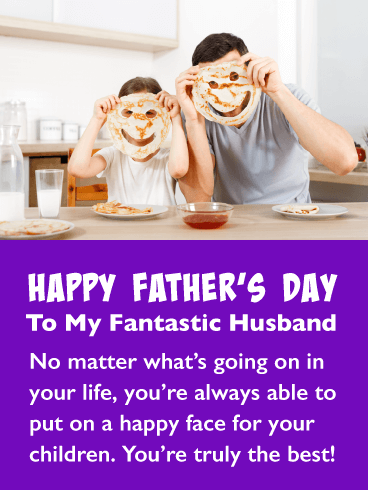 Send your husband a few laughs and a couple of smiles with this fun pancake happy face Father’s Day card. It will certainly make him feel great on this special day. It showcases a father and child who have created smiley faces out of their food! The message lets him know that you recognize how good he is with the kids no matter what’s going on his life. 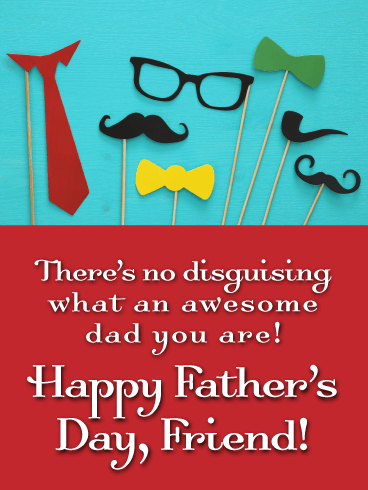 Be sure to make this Father’s Day an occasion to remember with this awesome greeting card! Do you come home to find your husband doing amazing activities with your kids, and sometimes you try not to laugh? If so, then this would be the perfect Father’s Day card for your husband. It features a cute and funny image of a father and daughter ballet dancing and spending quality time together. This will give your husband a little laugh, as well as make him smile. 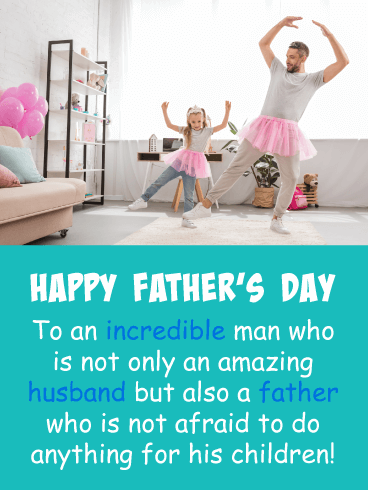 Send this special Father’s Day card over to your husband today! This Father’s Day card could possibly be the best card your friend will receive today. It will certainly make him feel like an invincible father. 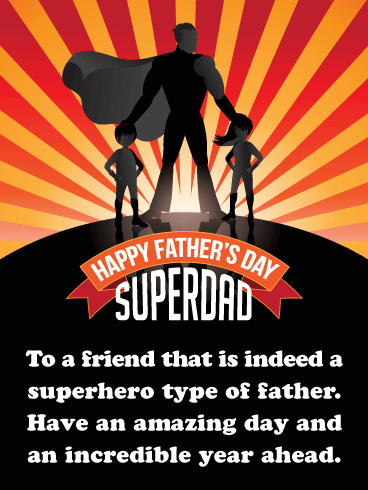 Who wouldn’t want to be called a Super Dad and a Superhero. It’s perfect! The colors of orange and black look awesome together, and the father and children silhouettes make this card even more special. Send this Father’s Day card out today, your friend is going to love it. 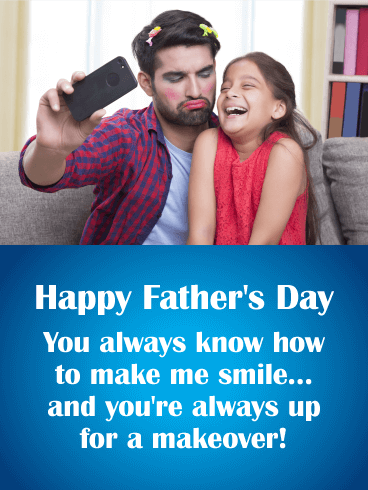 Give your friend a good laugh with this cute and funny Father’s Day card. It showcases two children drawing on their father’s face! The card’s message will bring him joy and make him appreciate you even more. Get this greeting card over to your buddy today so he can enjoy it on Father’s Day. 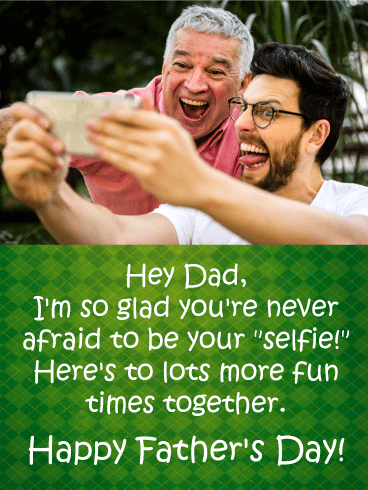 Send a Father’s Day card to your buddy that will give him a good laugh. 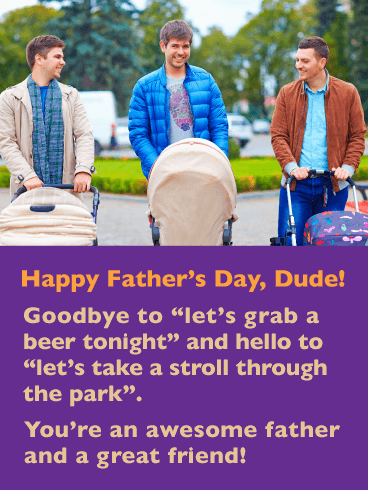 This greeting card features three guys taking a stroll through the park instead of going out for a beer. 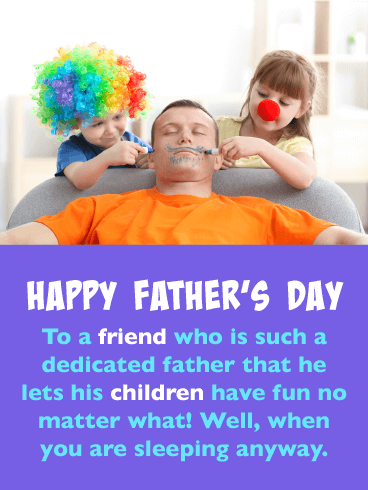 The card’s message cleverly makes fun of this, but in the end, your friend is a good father that would rather spend time with his child then go out partying with his friends. So wish him a Happy Father’s Day and let him know you are thinking of him today. Whether your brother loves puns or whether they make him groan in fake disgust, this card is sure to tickle his funny bone! 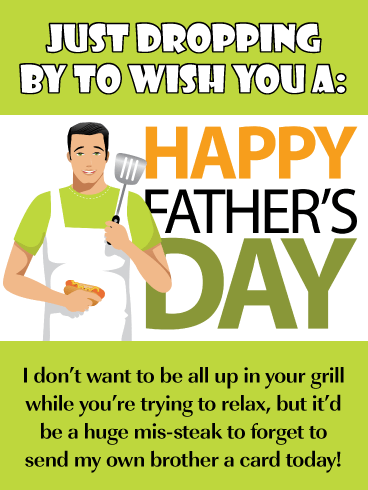 Send that master of the barbecue the Grilling Jokes Happy Father’s Day Card. It will reassure him that while you don’t want to be all up in his grill…it sure would be a huge missed steak if you forgot today! Quit puttering around and pick out a Father’s Day Card for your brother already why don’t you? Is your brother a golfing enthusiast? Whether he’s serious about his golf game or it’s just a casual hobby he’ll enjoy this bright green card full of golf jokes! 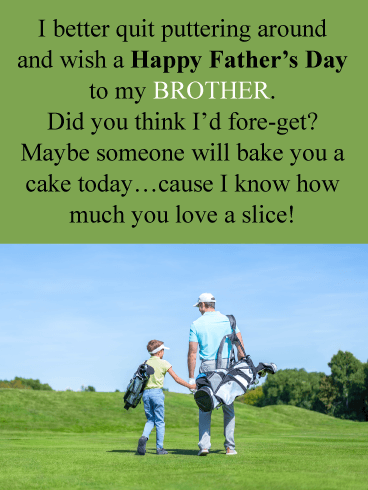 Send the Golf Puns Happy Father’s Day Card to have your brother rolling around in laughter. Is your brother the type of guy who wins awards for “Best Dressed”? Was he voted “Most Stylish” in high school? Or maybe his family insists on buying him tacky ties every year as a joke? Our Snappy Dresser Happy Father’s Day Card works for either scenario! Send it as a funny card or a completely serious card, it goes both ways. 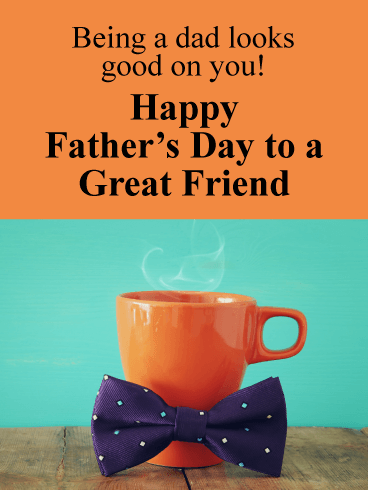 A cheerful orange mug is dressed up with a fun, printed tie to let a great friend know that being a dad looks good on him…just in time for Father’s Day! With a playful tone, this colorful card is perfect for anyone whose parenting style in on point 365 days a year. 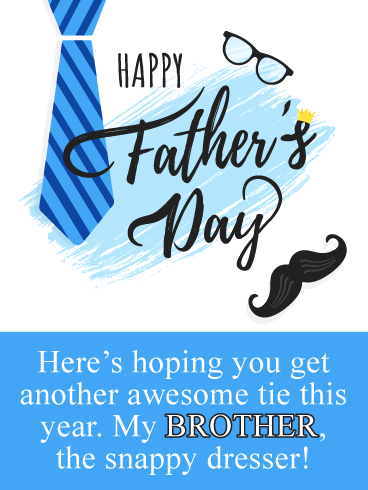 This fun, colorful card features lots of props, like ties, mustaches and a pipe, all perfect for wishing a good friend a very happy Father’s Day! No matter how many he puts on, there’s just no disguising what an awesome dad he is. It’s the kind of greeting to make him smile while making this year’s celebration the most memorable one yet! 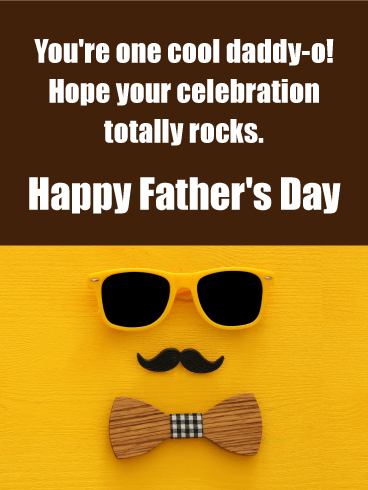 For an amazing dad who also happens to be your friend, this card is a fun way to wish him a happy Father’s Day! A little girl is giving her dad the ultimate makeover, complete with a headband and pink lipstick. And he’s more than happy to oblige. That’s what being a dad to his little girl is all about, and it’s one of the things that makes him so special in the eyes of his children and everyone around him. 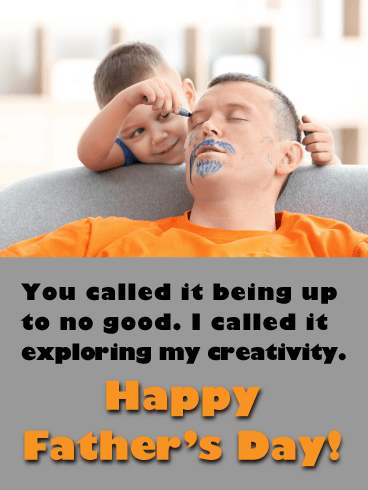 Get ready to have an awesome friend, and dad, in hysterics with this funny Father’s Day card! 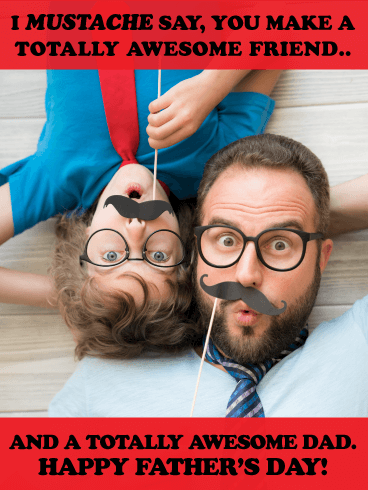 A young son and his dad are being silly posing with fake mustaches and wearing matching glasses as well. It’s the kind of greeting to remind him that he’s doing an amazing job and having a ton of fun while he’s at it! This adorable doggie will have a friend howling on Father’s Day. 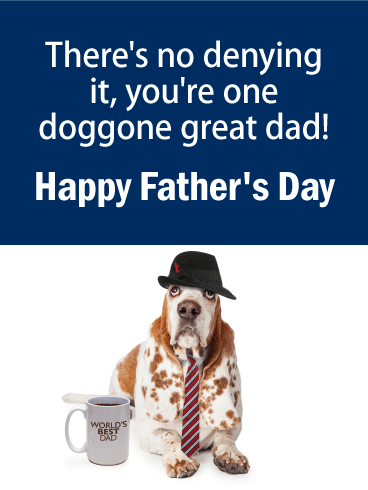 Because paws down, he’s the best dad around! 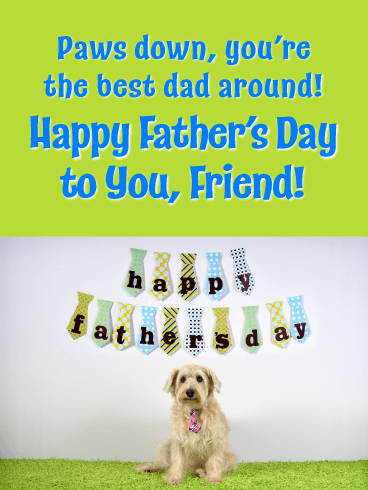 A bunch of colorful printed ties with a “Happy Father’s Day” greeting sit behind the pup, who’s also decked out in a tie of his own. It’s a mix of silly and sincere to help him celebrate his big day in style! 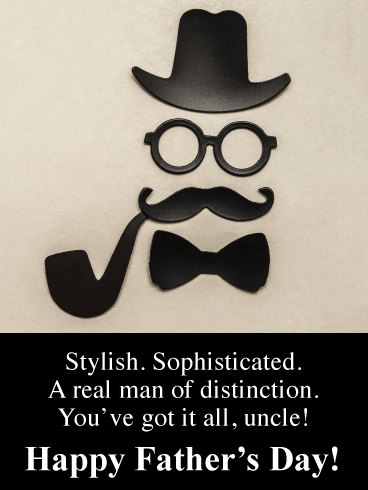 If your uncle is a distinguished gentleman in every way (or even if he just thinks he is), he’s bound to get lots of smiles out of this Father’s Day card! A black hat, glasses, mustache, pipe and bow tie are arranged to create the face of a real man of distinction. It’s a playful way to remind him of all the ways you admire him as he celebrates his big day in style. This Father’s Day card will have your favorite uncle in hysterics… and that’s no monkeying around! The playful chimpanzee is the perfect reminder that although you may not have picked him, you’re lucky to be stuck with such a cool person in your family. It’s the kind of greeting that comes with lots of laughs. 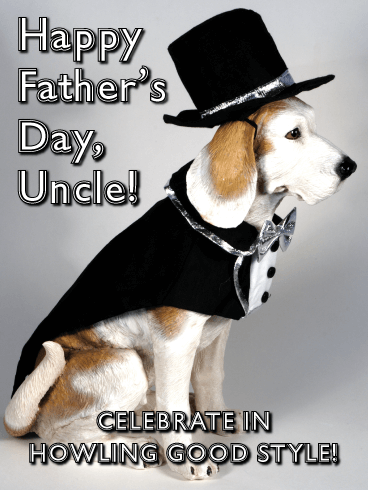 This dapper dog’s dressed in his very best to wish your uncle a Happy Father’s Day! From his top hat right down to his tuxedo and bow tie, he delivers lots of laughs, while reminding your uncle to celebrate in howling good style, even if his idea of excitement is doing nothing much at all! 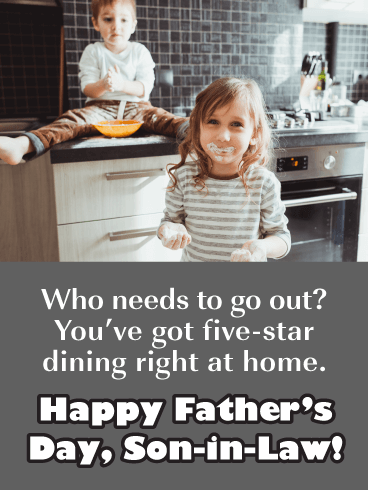 This fun Father's Day card has all the ingredients to help him celebrate in the best way possible! 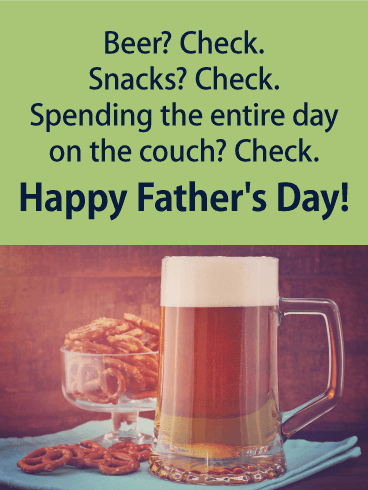 A big mug of beer sits next to a bowl overflowing with pretzels, perfect for snacking as he sits on the couch watching hours and hours of TV in between naps. It's a dream come true for every dad who looks forward to a day spent relaxing. And he's definitely earned it! 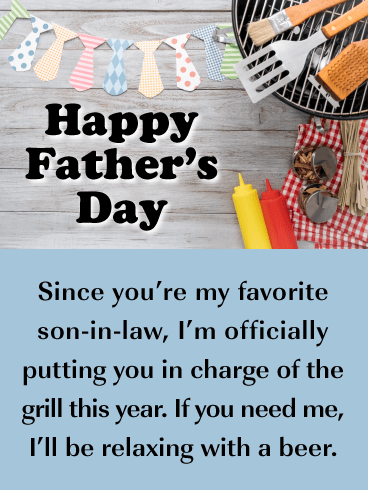 Barbecues are one of the best parts of every Father's Day, and if your dad is the ultimate grill master, this Father's day card will bring him lots of laughs! With apron on and tongs in hand, this guy is ready to grill up a feast for his family. So of course he needs some motivation, which is just what the words above bring! 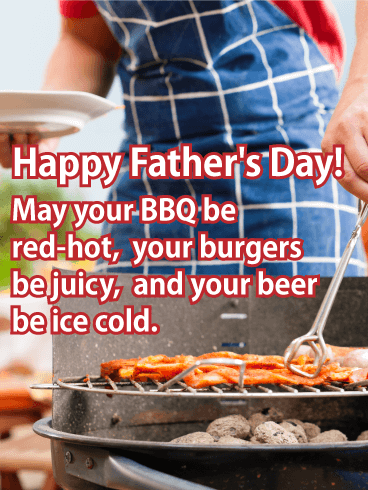 It's your wish for a red-hot BBQ, thick, juicy burgers and ice cold beer, all making for an unforgettable celebration!